Jack Willis, Carlo Alban, and K.T. Vogt in “Sweat”. 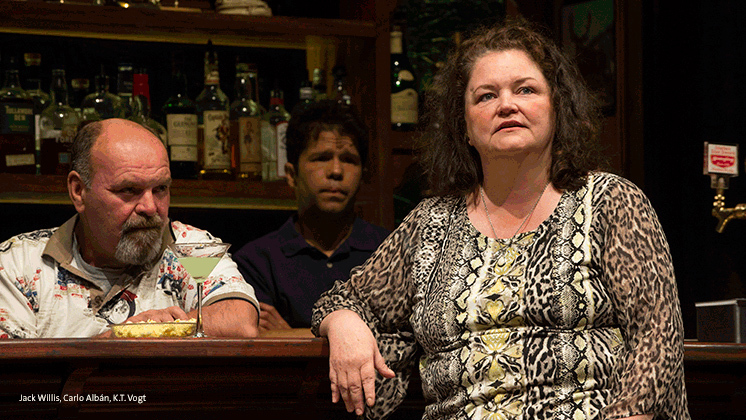 Sweat is Lynn Nottage’s brilliant story of people and community in collapse. Before writing this commissioned American Revolutions series play, Nottage talked to residents of America’s poorest city of 2001, Reading, Pennsylvania. Her work shares the residents’ pain, losses, and self-immolation as their good jobs are eliminated in relentless, financially logical, corporate-mandated factory closings and union busting. I knew the story’s outline coming into the theater. I expected satisfying liberal ranting and raving at the evils of unchecked capitalism. I anticipated heroic, self-sacrificing union people rallying together, and I imaged an uplifting ending engendered by a character or two’s meaningful transformation from floor machinist to educated professional. Or, some other dramatically reasonable redemption that would further Nottage’s growing reputation. Fortunately, Nottage did not write Sweat with my limited vision. Instead, her approach, plot, and words are extraordinary masterpieces. Her exposition is unconventional, unexpected, and completely involving. The play’s action occurs in 2008 and in a series of scenes in 2000. We start out seeing key players in 2008, and then Nottage takes us on a chunk-by-chunk visit to the days in 2000 that led to the creation of the 2008 characters. We wind up in modern day (2008) and with the same group of locals from the 2000 neighborhood bar. The 2000 disruption, drama, and dissolution had been excellently crafted and spectacularly well executed onstage in front of us. The drawing of the characters, the choice of illustrative scenes, and the depth of the language of the eight-year-old scenes were alone striking enough to make Sweat a classic. Yet, the depth of the individual and collective destruction becomes gasp-inducingly crushing when the audience and characters return to 2008. We understood previously that unpleasant things were happening to our people. But, the time-spaced moments at the play’s conclusion go beyond our earlier intellectual understanding of tragedy and force us to witness and feel the wreckage of minds, souls, and bodies. Trying more to describe the power Sweat’s writing would be foolish. I’d be in danger of substituting my language for Nottage’s. It just needs to be said that Sweat is an amazing piece of theater based solely on the vivid story and writing. Then, after giving full credit to the experience to Nottage, we need to add superlative positive descriptions for every other professional contributor of the OSF. Really. Every actor owned their role. There were no moments when I second guessed the tone or action of any of the people on stage. The length of my applause for each actor pretty much follows the number of lines they were given to say. Certainly Jack Willis (bartender Stan) had a perfect read on his part from beginning to the very end. Ashland newcomer Tramell Tillman (Chris) used both facial expressions and body movement exceptionally well to accompany his otherwise flawless acting. Of course, any mention of well controlled movement coupled with devastating line delivery needs to lead to a shout out to Terri McMahon. Her drinking buddies Kimberly Scott (Cynthia) and K.T. Vogt (Jessie) also had their own focus-riveting moments, and those women’s work was impeccable. But, now I want to reorder the positive comments because it’s not fair to leave Carlo Alban (Oscar) until now. He gave a spot-on performance of a role with a lot of onstage downtime coupled with a few critical scenes. And, Tyrone Wilson (Evan)’s probation officer sets up key moments with mouthfuls of exposition. Wilson is skilled getting things said with real and appropriate humanness. Which unfairly leaves Kevin Kenerly (Brucie) to last. (Please shuffle the order of actor kudos!) Brucie in word and presence is a Cassandra-like warning for the other regulars in the bar. Yet, Kenerly’s straight-forward, strong but low-key portrayal leaves the audience responsible for connecting the dots. Better than excellent acting, all. Then there’s the set. Innovative, effective, and richly done. Scenic designer John Lee Beatty created a canvass that let the action move smoothly and quickly and effectively. The scenery, props, and videos (by Jeff Sugg) worked together with comfort and clarity. With so many facets of Sweat being flat-out wonderful/meaningful/affecting clearly thanks and credit are due to another Ashland newcomer, director Kate Whoriskey. All aspects of the evening are in sync. Whoriskey was part of the Nottage team that worked on the ground in Reading (if I read the Playbill correctly), and her resulting artistic choices made a memorable theatrical event. This world premier feels like a shaken-out classic. The minor flaws I noticed are not worth mentioning. I am grateful to Oregon Shakespeare festival for their ambitious commissions, to Lynn Nottage for her story, and to the cast and crafts for their artistry. This entry was posted in osf, plays and tagged 5 stars, Ashland, Lynn Lynn Nottage, OSF, Reading, World Premiere. Bookmark the permalink.